It was with a sense of great anticipation and excitement that we welcomed Peter Tatchell to Wycombe Abbey to speak at Evensong on Sunday 20 January. Peter has given 50 years of his life to being a human rights activist and he shared with us some of his triumphs and many of his struggles. Peter began life in Australia in a strict religious family, with a mother who was often unwell. He left school aged 16 to work and financially contribute to his mother’s medical care. He spoke of his earliest campaigns in Australia fighting for the rights of the Aboriginal people before telling us of his move to London in 1971 where he became the leading person for the gay liberation front. There were many stories that he shared from the 1970’s and 1980’s that, in our time, seemed both shocking and comedic. Such stories included the ‘sit-in’s’ in London pubs and restaurants that refused to serve gay people. He and his fellow campaigners simply won that battle by emptying those establishments of their homophobic customers and then being welcomed by owners to eat, drink and be merry. Another favourite story that Peter shared was about the time when he made a citizen’s arrest in London of the notorious President of Zimbabwe, Robert Mugabe in 1999. Peter shared with us that after much research and investigation he believed that thanks to the principle of universal jurisdiction, human rights violations could indeed be pursued against a head of state. Therefore, Peter, along with three other activists, waited outside a London Hotel where they were told Mr Mugabe was staying. Eventually Mr Mugabe left his hotel in a car which to his astonishment Peter managed to stop, opened the door and attempted to perform a citizen’s arrest. Peter brought his talk to a close by encouraging us all to stand up for what is right. He inspired us all to not give up, even when things are really tough, if the cause is a good and worthy one. 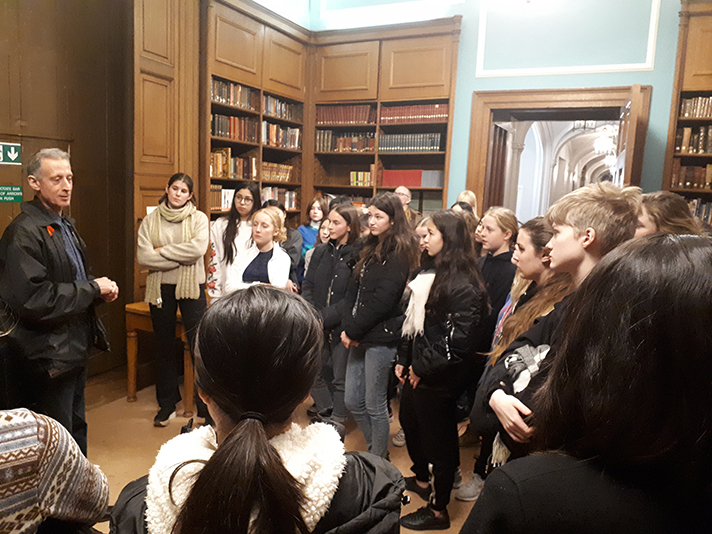 There was a rapturous round of applause by everyone in Chapel that evening and following the service many girls met with Peter in Fisher Library for a Q&A session.